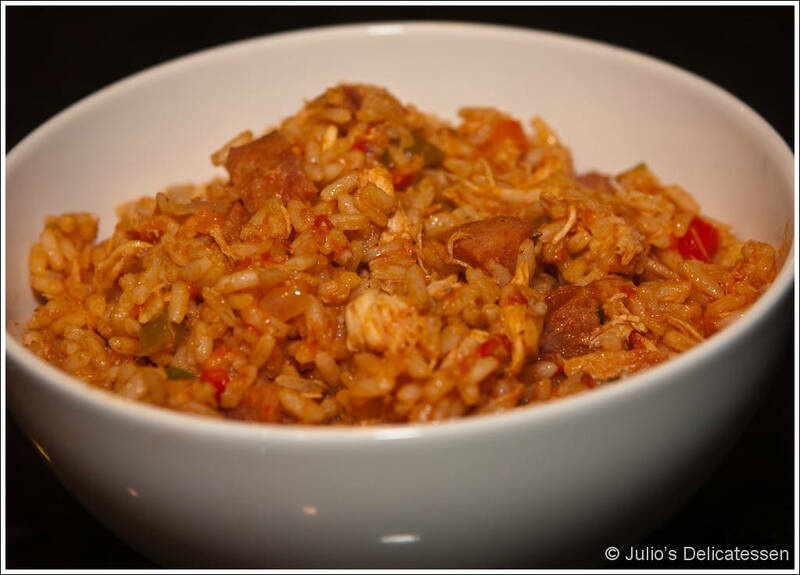 In honor of Super Bowl Sunday, I made an enormous batch of Chicken and Sausage Jambalaya. No time to add comments to this post – there are commercials to watch. Preheat oven to 450. In a large Dutch oven, melt butter over medium-high heat until foamy. Add sausage and cook – stirring occasionally – until lightly browned – about 5 minutes. Add onions, celery, peppers, salt, and pepper, and cook until onions are translucent – about 10 minutes. Add garlic and cook for another 30 seconds. Add chicken, stock, tomatoes, thyme, bay leaves, hot sauce, Worcestershire, and coriander. Stir, then bring to a simmer. Quickly add rice, make sure all grains are submerged in the liquid, cover pot, and transfer to oven. Cook for 30 minutes without removing the lid. Check to see if all liquid has been absorbed and rice is tender. If not, replace lid and cook another 10 minutes or so. When the rice is tender, discard the thyme and bay leaves. Add salt as necessary and top with chopped scallions. the wok, stir and serve immediately.